Held under the theme of ‘Making the United Nations relevant to all people: global leadership and shared responsibilities for peaceful, equitable and sustainable societies,’ leaders from the world’s largest nations and economies to the world’s smallest swore fealty to the UN and its Charter, and the need to reform the Organization in the face of a daunting future. 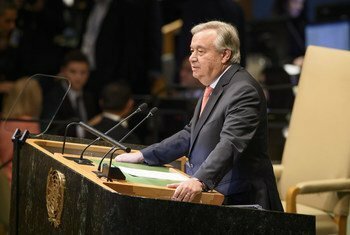 Secretary-General António Guterres and Assembly President María Fernanda Espinosa Garcés set the tone with their opening speeches on day one of the six-day high-level segment devoted to addresses from the UN’s 193 Member States, many of them led by Heads of State and Government. 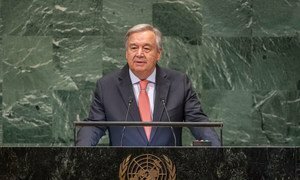 Secretary-General Guterres address the General Assembly on the opening day of its annual debate. “As guardians of the common good, we also have a duty to promote and support a reformed, reinvigorated and strengthened multilateral system,” Mr. Guterres said, a theme Ms. Espinosa emphasized. “Multilateralism is the only possible answer to the global problems we face. Weakening or putting it in question only generates instability and bewilderment, distrust and polarization,” she said. In all, 77 Heads of State, five Vice-Presidents, 44 Heads of Government, four Deputy Prime Ministers, 54 Ministers, one Vice-Minister, and eight Chairs of Delegation mounted the podium during the six days. National leaders, while often devoting much attention to their particular interests and specific details, did not fail to mention the world body’s significance. Nearly all countries called for massive action to mitigate the potentially catastrophic impact of climate change and rising oceans, and stressed the need for international cooperation to achieve the Sustainable Development Goals (SDGs), which seek to eliminate a whole host of social ills, from extreme poverty and hunger to access for all to health care and education, all by 2030. For many countries, especially from Africa, a special priority is reform of the 15-member Security Council, the only UN body whose resolutions have legal enforcement status. They want new permanent members outside of the current five, the Second World War allies of China, France, Russia, the United Kingdom and the United States, all of which have veto power, and are known by the shorthand, ‘P-5’. They point out that the world has vastly changed since the UN was set up in 1945 with 51 Member States and an 11-member Council, with six rotating non-permanent members serving two-year terms. The Council was last enlarged in 1965 with the addition of four non-permanent members. UN Member States now number 193 yet the Council remains stuck at 15, which they called a negation of fair representation and true democracy. For the sake of democracy, they also called for more powers to be devolved to the General Assembly which encompasses all 193 Member States. One of the major complaints about the Council membership is the permanent members’ veto powers, long seen as a hurdle to urgent collective action when any of the five prioritizes its own national interests over global needs. 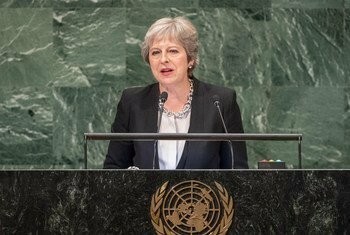 Prime Minister Theresa May of the United Kingdom of Great Britain and Northern Ireland addresses the seventy-third session of the United Nations General Assembly. Foreign Minister Sergey Lavrov of Russia made no mention of Council reform, but instead lamented that diplomacy has been “increasingly replaced by dictate and unilateral extraterritorial restrictions put in effect without the consent of the UN Security Council.” The Council-authorized international military presence In Kosovo is being transformed into a US military base, he added. Chinese Foreign Minister Wang Yi also made no mention of reform, but warned that if the nuclear accord limiting Iran’s atomic activities in return for a lifting of sanctions, from which the US has withdrawn, fails to be implemented, the Council’s authority and role will be challenged, and peace and stability in both the region and the wider world jeopardized. US President Donald Trump himself sounded a more unilateral theme, rejecting the “ideology of globalism,” and made no mention of Council reform, but he did reiterate US commitment to making the UN more effective and accountable. “I have said many times that the United Nations has unlimited potential,” he declared. 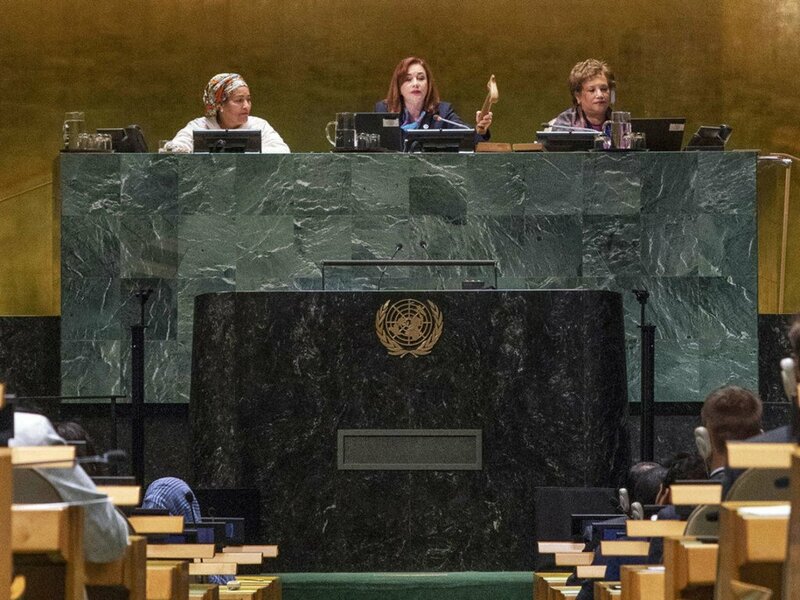 With the need to promote and guarantee a multilateral, rules-based global order on the minds of the bulk of the speakers in the past week, bolstering support for the landmark Paris Agreement on climate change and the 2030 Agenda for Sustainable Development was also a key focus, as was the need to ensure gender equality and women’s empowerment. “This United Nations must show leadership in recognizing the talents and contributions of women to human civilization and progress,” Mia Amor Mottley, the first woman Prime Minister of Barbados told the Assembly on Friday before rushing back to her country, which was being drenched by Tropical Strom Erik. Summing up the six-day session, Assembly President Espinosa on Monday underscored the importance given to multilateralism as the only way to address the problems facing humankind. 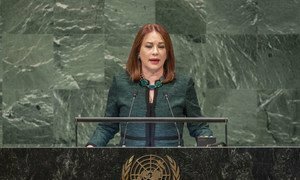 With a call to multilateralism and shared work towards sustainable development and equality for all, María Fernanda Espinosa formally inaugurated the seventy-third general debate of the of the United Nations General Assembly.